Espresso is a mysterious drink. Not many people really know what it really is, how it’s made, or even what it should taste like. We've all been lured into a haze of misunderstanding and misinformation by the likes of Starbucks, Nespresso, Krups, and countless other brands looking to make espresso easy and cheap. Don't take the bait. Espresso, done right, is wonderful. Here's how the best in the business do it. Espresso is not type of coffee bean, or a type of roast. Espresso is simply a method, a way to brew coffee. In fact, any coffee can be brewed as espresso—though some types taste better than others. Making espresso involves pushing hot water through a compact ‘puck’ of grounds at high pressure, usually at around 9 bar (9 times the atmospheric pressure at sea level). The reason you see bags of coffee labeled as espresso is either because its contents are pre-ground to a fine size that suits espresso brewing, or it is a blend that has been crafted to create a balance of flavors when brewed as espresso. To brew great espresso, a confluence of events must occur that marries human judgment with mechanical precision. It starts with decisions made by the roaster. Will they be making a blend of different coffee types to create a balance of flavors, or will they use a single-origin bean to highlight an experience unique to that particular variety? Once a bag of beans has found its way to a human person preparing a drink, it is up to that person to make sure the beans are fresh, meaning no more than 2 weeks from the roast date, and ground immediately before brewing. There are certain aromatics in ground coffee that will evaporate within 20 minutes of grinding, so quickness is paramount. The grind size will vary based on characteristics of the coffee such as age, bean variety, and roast-profile. Even at the highest level there is no secret formula, with adjustments being made according to taste. The coffee is then precisely dosed, compacted into a basket, or portafilter, and finally meets the mysterious espresso machine. All espresso machines utilize boilers containing a heating element that brings the water to the proper temperature. The pressure to pull a shot is generated by either a piston (found in older manual machines), steam power (in modern low-end machines), or a motor-driven pump. Commercial machines use a rotary pump that keeps constant pressure, whereas smaller machines use a vibration pump that generates pressure only as the shot is being pulled. The name of the game in a good espresso machine is stability. Any fluctuation in heat, even to the tune of a couple of degrees Farenheit, can alter the taste of the coffee and make it impossible to pull consistently good shots. High-end espresso machines rely on a few important mechanisms for maintaining heat and pressure throughout the brewing process. The first must-have is a double boiler system, where one boiler heats water for the brew, and another heats water for the steam wand. The two processes have different temperature needs—212 F for steam, 200 F for espresso. Having separate boilers will ensure that neither process throws the other off. The other important mechanism is a PID (proportional-integral-derivative) controller. PID is a generic term for a controller that maintains a set value using control feedback loops. Many common devices use PIDs—a cruise control in a car might use one to maintain a certain speed based on calculating incremental changes over time. In espresso machines, the PID maintains constant water temperature, controllable to the degree. Without it, the heat level is prone to wide swings and makes consistency extremely difficult. There are of course other aspects to a good espresso machine, mostly having to do with build quality, longevity, and ability to withstand the rigors of a commercial setting. The type of metal that the boilers are composed of, the pre-heating system featured, whether it is plumbed or reservoir-based—it all contributes to what is possible when you let the coffee flow. Whatever you've had in Starbucks, or from a pod, or in a deli, does not reflect even a fraction of what a well-made espresso tastes like. Therein lies the problem—the majority of casual coffee drinkers have never actually had a good shot, so they don’t know what to expect. Espresso made from freshly roasted, freshly ground coffee, made on a commercial machine by someone who has paid close attention to the process, should taste rich and sweet. Each coffee has its own flavor profile—fruity, chocolatey, floral—but it should never taste burnt, ashy, bitter, or sour. While most blends are meant to be mellow and appeal to a broad audience, you might want to try a single-origin coffee something totally different. And remember, it can be an acquired taste. Don't give up if you don't like what you taste at first! Also, don't get hung up on the tasting notes you see in specialty cafes. Not only are they often out-of-date, they push you toward pre-conceived notions when you really should be seeing, and tasting, for yourself. Trying to make good espresso at home is often fraught with buyer's remorse. It's easy to be seduced by the promise of a $100 machine advertising “up to 15 bars of pressure! !” These machines lack pressure regulation that would maintain 9 bars of pressure throughout the whole shot (20-30 seconds). Nespresso and other pod machines are convenient, but cannot produce quality espresso. Not only do they lack the proper mechanics, but the coffee is of poor quality and pre-ground. The first thing you need, no matter what machine you are using, is a good grinder. Without a good conical burr grinder that produces fine, consistent grounds, and can be precisely adjusted, your $5000 espresso machine will go to waste. At the lowest end, an espresso-capable grinder will run about $300, but many enthusiasts will tell you that you need to spend around $500 on something like a Baratza Vario to really dial in settings that are precise enough. If you want something more robust, you could consider a machine with a heat-exchange (HX) system. These machines have one boiler, but will allow you to steam milk and pull a shot without delay. They're still prone to instability in temperature, though, especially if they idle too long. Even so, expect to pay over $1500 for an HX machine. Finally, we come to double-boiler (DB) home espresso machines. These rigs are the best for a worry-free experience. They usually feature a PID, so you can dial in a shot temperature, and pull shot after shot, steaming milk at the same time, with reliable consistency. Until recently, double-boilers machines would run you upward of $2000. Most high-end espresso machines are Italian-made and imported, not to mention expensive. A couple of years ago, Breville—that of the Williams Sonoma ubiquity—decided to be bold and tackle serious espresso making with the release of a double-boiler model. 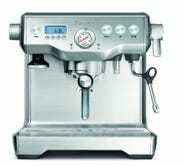 The company claims it consulted with espresso experts and baristas in order to make a truly high-quality machine. We had a chance to test out the Breville BES900XL and were impressed with its capabilities. The Breville allows for tons of control over brewing, such as shot temperature, pre-infusion time, and pre-infusion pressure adjustment. It also has some really great conveniences such as a wheeled base and font-filling reservoir that you wouldn’t normally find on an Italian machine. It produces great espresso, provided you are grinding with a suitable burr grinder and playing with the variables to suit the coffee. Many experienced baristas have recommended the Breville Dual-Boiler, but some still have reservations. The machine is about $1200, much cheaper than other comparable machines, which leads some to question the reliability of its parts. Will it last you 5, 10, 20 years? We don’t know. But Breville is definitely shaking things up by taking home espresso making seriously, as opposed to dumbing it down. All this for one ounce of coffee? For many, espresso, and coffee in general, is purely functional. A pick-me-up. Obsessing over things like mouthfeel, crema color, and grind size will always seem ridiculous to the vast majority. But once you get a taste of a truly remarkable espresso, it’s hard not to seek more. Journeying to coffee shops, each with different beans, machines, and atmosphere is fun, but nothing is more satisfying than bringing the experience home and crafting something for yourself. Sadly, it is expensive, but technology is driving new solutions, especially with the huge upswing in coffee interest. There are Kickstarter projects and portable devices vying to make life easier for espresso drinkers. Still, the best methods remain in pumps and boilers, the age-old mechanics that give us the perfect shot.